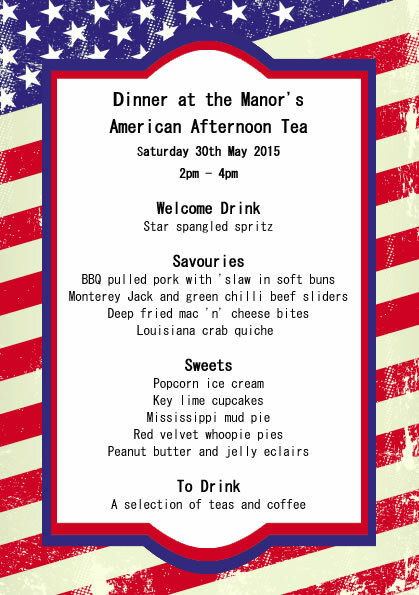 We’re hosting an Afternoon Tea tomorrow and the theme is all things filthy and American. We thought we’d tease you with the menu so you can see how lucky our guests will be! Let us know what you think and look out for photos from the event in the next couple of days! This entry was posted in Menus and tagged 2015 dates, Afternoon Tea, America, American Food, baking, burgers, cakes, Dinner at the Manor, Leeds, Menu, supperclub, Underground Dining, Underground Restaurant on May 29, 2015 by martinimanleeds. It’s been a while since we’ve done a review of a Leeds restaurant, we’re too busy eating elsewhere! Anyway we had an impromptu trip to Pintura last night, to welcome in the weekend, and the food was so good we thought we’d tell you all about it. Pintura is one of the newer additions to Trinity and is a Basque style tapas bar. We’ve been before when it was soft launching and whilst it had a few teething problems the food was undoubtedly top notch so we didn’t think twice about returning. Upon arrival you are invited to have a drink in their stylish gin bar. The gins are certainly plentiful but it was sherry for us. Susie enjoyed a clean crisp fino full of salty nutty aromas whereas I went for a mazanilla which is slightly nuttier and sweeter. It was a perfect tipple for a sunny evening, although for some reason the sherry isn’t kept behind the bar so you have to wait quite a while whilst the bar staff go and hunt some down. When we were ready to sit down for dinner we were taken to a lovely leather booth, full of retro charm. The table was amply sized for the two of us, which is always a bonus when many tapas dishes are being ordered! Whilst we sat and perused the menu we nibbled on little spicy sausages with a homemade ketchup dipping sauce. These were a bit chewy but full of flavour. 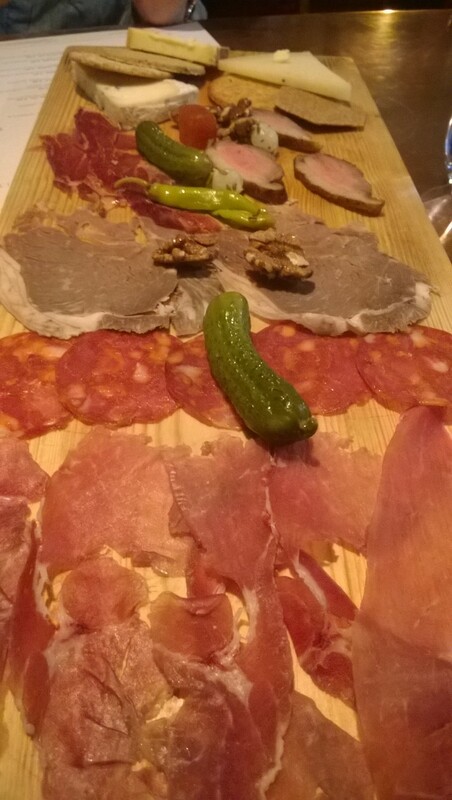 For our starter we had a platter of meats and cheeses. We had this as part of the soft launch but what was presented was far bigger than what we had enjoyed last time! The meats included a wonderful smoked duck, air dried Basque ham and Iberico. The cheeses included manchego, a blue and a very stinky one that went excellently with the quince jam. I loved all the little garnishes like pickled chillis, toasted walnuts, gherkins and mini pickled onions. We were quite full after this platter! The theme for our tapas element was PORK! 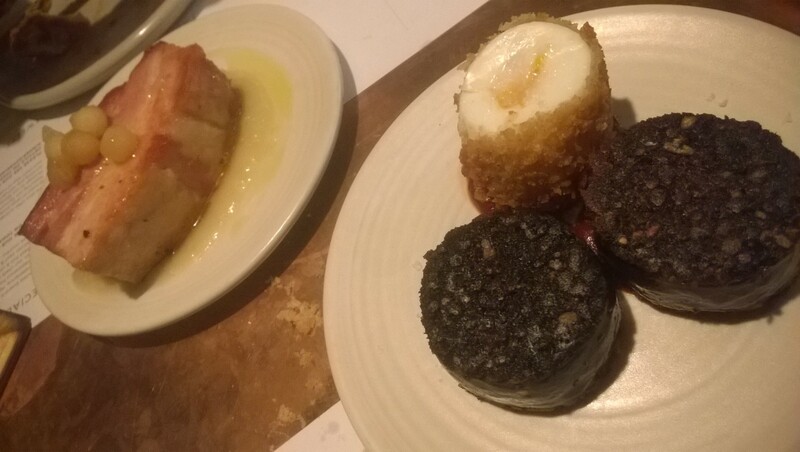 This came three ways – black pudding; pork belly and pig cheek. The pig cheek was probably our favourite. This came soft and salty with a beautifully spiced, sweet cauliflower puree and crispy pig ears. The black pudding is always a winner especially with a crispy fried runny egg. The pork belly was our least favourite – a large slab of belly that was overly salty and a bit flat in flavour. 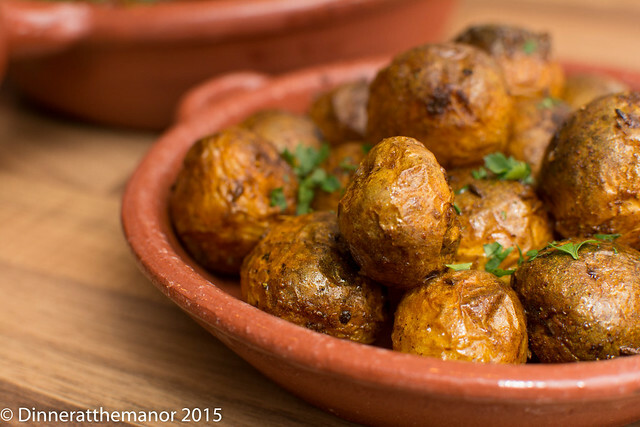 Also in our spread were little roast potatoes, roasted in smoked duck fat. The fat did indeed give a beautiful smoky flavour, however the potatoes were flabby instead of crispy, which was disappointing. 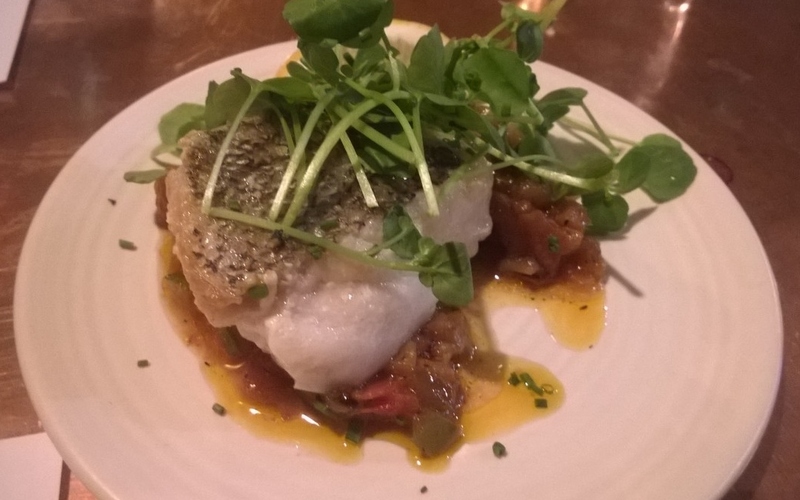 Our fish dish was a special of hake which came perfectly cooked with a piquant ratatouille style sauce. Our veggie dish was a Basque style runny omelette which comes in its own cute little frying pan. This burst open to reveal runny egg and caramelised onions. In terms of drinks we of course enjoyed a Spanish red – Luis Alegre Rioja. This was very easy drinking, fruity with a bit of a liquorice kick. We didn’t have room for dessert after our tapas feast so instead we had… more wine! This time we had glasses of Carpess Crianza Tempranillo. This was deep, spicy and full of dark fruits like dark cherry. I thought the wine list was very good. Lots of Spanish options as well as world wines, and our wine ranged from £20-£30 a bottle. The list looks like it has been put together well without any duds. Our only criticism was the time it took for wine to be brought to us. Our final glasses took at least 20 mins to arrive after ordering them. It was served at a beautiful temperature so maybe they were warming it up! All in all our huge feast, wine and sherries came in at a not insignificant £50 per person (including tip). However I left feeling nicely full of food and wine so I feel this was good value. The meat and cheese platter was £15 alone and if I’m honest, given its unexpected size, we didn’t really need it. So, if like us you’ve run out of inspiration about where to go for tea in Leeds then do give Pintura a go. It’s a very relaxed and informal environment and food and wine is of good quality. Just make sure you ring your wine orders ahead if you want to have them with your meal! This entry was posted in Reviews and tagged Leeds, pintura, Restaurants, Reviews, spanish food, supperclub on May 16, 2015 by martinimanleeds. Probably my favourite cook book of this year so far is Persiana. Written by fellow supperclub host and lovely lady Sabrina Ghayour, it’s a colourful and accessible look at the Persian food she grew up with and taught herself to cook. Sabrina has achieved the ultimate dream for us supperclub hosts – a published cook book and regular stints on Saturday Kitchen! On the face of it the book is fairly simple. Most recipes only have a handful of supermarket ingredients and don’t have many cooking techniques – and yet the flavours Ghayour manages to create stupefy me. I was amazed when I first gave it a go and still am to this day! So it felt a very easy decision to make this our next supperclub. On the night guests were welcomed with a refreshing cocktail of vodka, pomegranate, ginger and lime – this was a deep ruby red and full of sweetness and spice. For canapés we picked dishes that would tantalise the tastebuds and excite the eyes. I made the herb frittata and served it on a bed of aubergine and tomato dip. The frittata does have a lot of fresh herbs in it, and I even halved it from the recipe! The lurid green was awakened by little bursts of red pomegranate seed. I also made the scallop with fennel, saffron and orange. 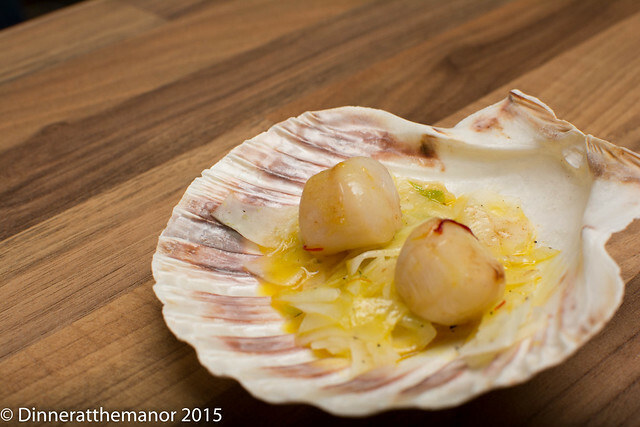 Little queenie scallops were fried quickly in butter and then served up in the scallop shell with shaved fennel and a sweet, heady dressing of orange, saffron and honey. Susie made the little lamb koftes – essentially succulent lamb mince bound together with the likes of sweet dates and nutty pinenuts. 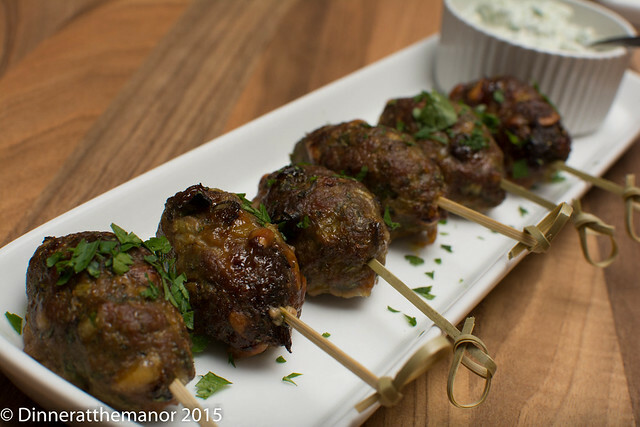 These came with cacis, a little yoghurt,cucumber and dill sauce to dip them in. Next up was a pre starter of spiced squash soup. 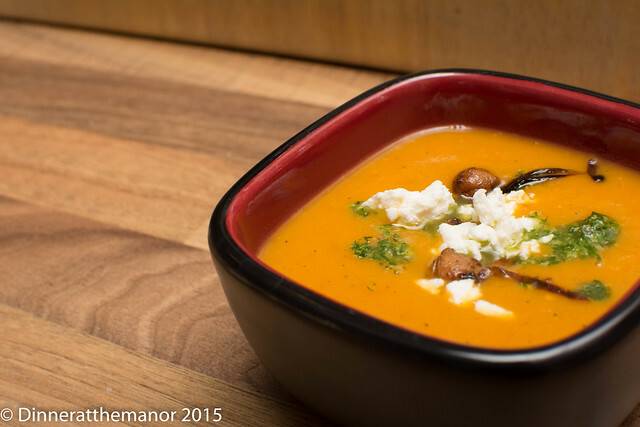 This soup got guests talking and reaching for the book to find out any secret ingredients that made it so tasty! The soup base itself is a fairly standard spiced vegetable soup, however it came with a range of garnishes such as herb oil (which was more like a pesto when we followed the recipe), spiced chickpeas and crumbled feta cheese. A very decadent soup course that could even be a meal by itself. 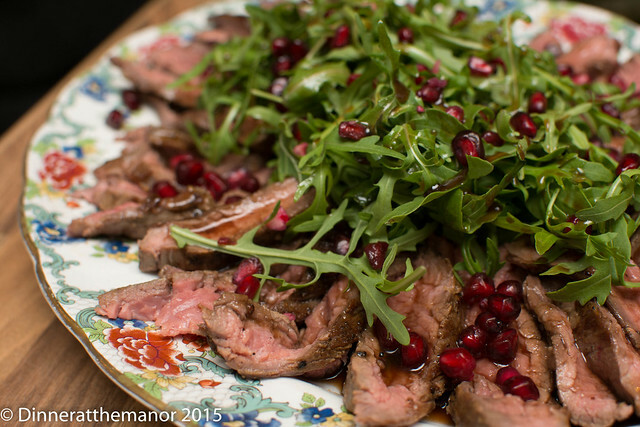 Susie’s starter was a showpiece of seared beef skirt with pomegranate dressing. Beef was cooked to medium rare, left to rest and then sliced thinly. It was served luke warm arranged prettily on platters with an addictive sweet and sour sauce made from pomegranate molasses and balsamic vinegar. 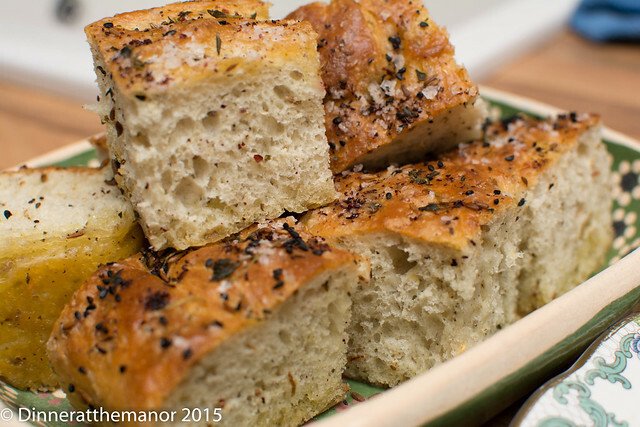 To accompany the beef was a fluffy, spicy Persiana take on a focaccia. This bread was lovely to nibble on and came spiked with lovely flavours of the Middle East – thyme, sumac, cumin and chilli. I liked to dip it in the soup for the ultimate treat! We gave guests a little break as the main event was yet to come! This came in the form of a smorgasbord of tagines and rices. From having cooked many of Ghayour’s dishes I think her tagines and slow cooked meats are her most triumphant dishes – full of clever layers of flavour, sometimes unexpected. 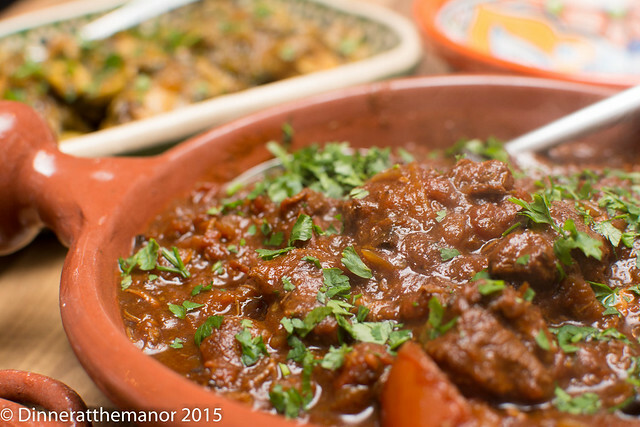 First up was a sweet and rich lamb tagine with tomato and black garlic. This was cooked for 3-4 hours making the lamb soft and melting. Ghayour uses shanks for hers but we used shoulder to make it a bit easier to serve at the supperclub. We happened to have black garlic in but you could substitute it for more balsamic vinegar (which is in the recipe anyway). The black garlic does give it a sweet smokiness that is hard to recreate! 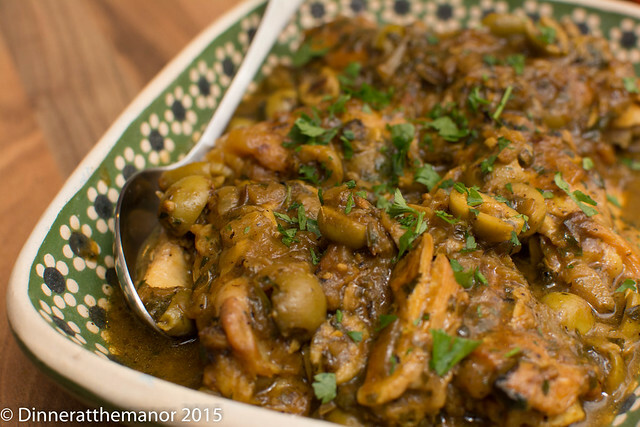 The next tagine (my favourite) was a very traditional tagine of chicken with preserved lemon and olive. Chicken thighs were cooked for about an hour in ginger, coriander and their own juices. Right at the last minute chopped preserved lemon and green olives are added. These almost cook down to a paste and give the most wonderful sour, bitter, piquant flavours I have ever tasted. This really pushed the saltiness limits, but in a very exciting way. I’ve been cooking this nearly every week since! For sides I made the shirazi salad which is like a salsa really – lots of finely chopped cucumber, tomato and red onion bound together with sumac. I hate cucumber but I thought this would freshen up the richness of the tagines. I also prepared little roast potatoes with cumin and turmeric. Finally the rice dish I picked was a rice, lentil and onion dish. Onions are crisply fried with tons of spices and then rice and green lentils are left to steam with them. This was a very comforting side, full of charred and caramelised flavours. We do like to serve a sorbet at the Manor – it has healing qualities that make the fullest of stomachs able to eat yet more food! 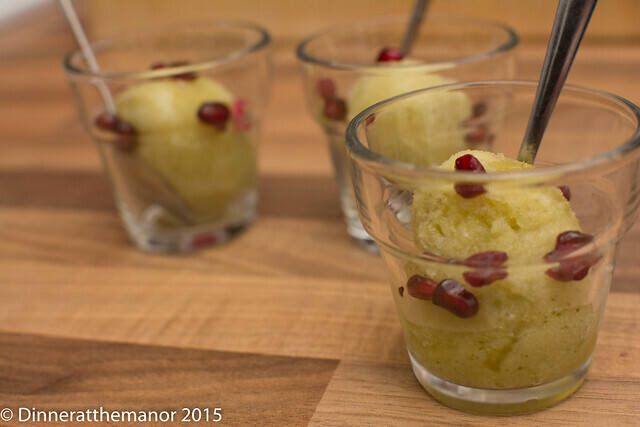 There were no sorbet recipes in Persiana but she does have a pineapple dish with herb sugar and so I adapted this and froze it! Pineapple was blended with mint, basil, rose water and (lots of) sugar syrup and then churned up. This made another luridly green dish but with unexpected flavours from the sour pineapple, fragrant herbs and sweet rose. If Sabrina wants the recipe for her next book I’ll sell it to her! Susie’s dessert was a very pretty little dish of Eastern mess. 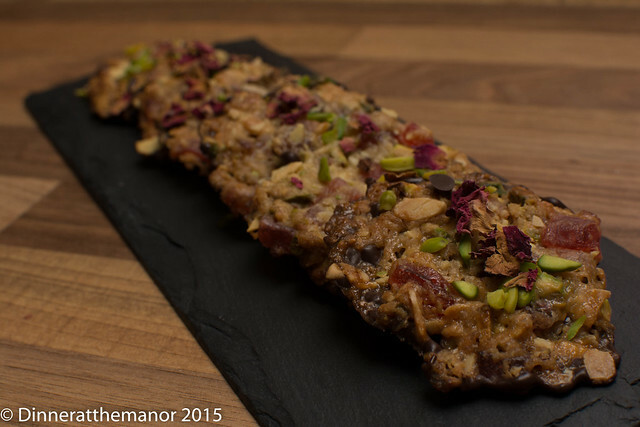 Taking the British Eton mess as its inspiration this has had a Persiana makeover. 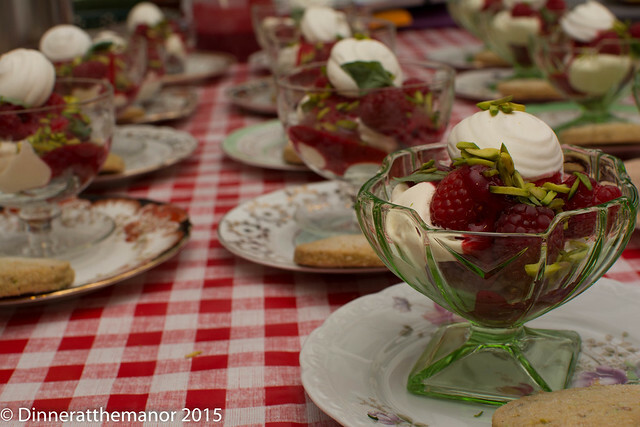 Sharp raspberries and raspberry sauce were mixed with rose water and then layered with crisp and chewy homemade meringues, cream sweetened with sugar and rose water and beautiful nibbed pistachios. For added crunch a lemon and pistachio shortbread biscuit was served on the side. I loved the fragrant elements of the biscuit. Interestingly olive oil is added to the dough before baking, which I thought made for a very moist biscuit. 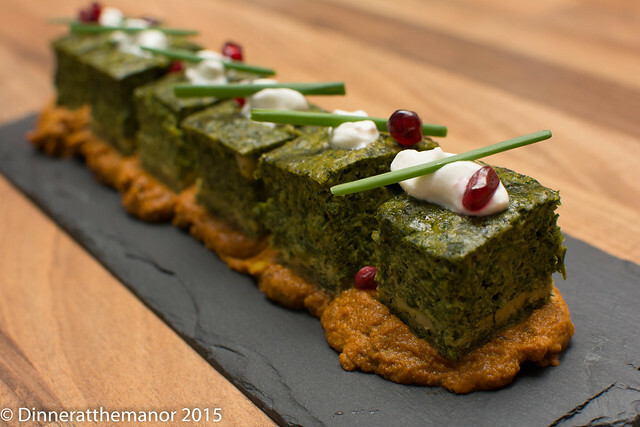 This entry was posted in Past Events and tagged 2015 dates, Dinner at the Manor, food, Leeds, Middle Eastern Food, persian, persian food, Supper Club, Underground Dining, Underground Restaurant, Yorkshire on May 7, 2015 by martinimanleeds.